Hi, everyone! Christine Sauer here! Several months ago I started a new group of abstract floral paintings. I’m so appreciative of being featured here! 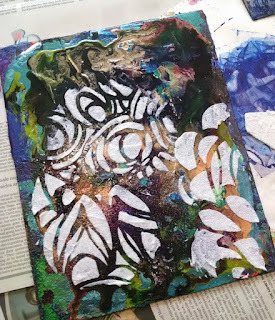 I really enjoy working with StencilGirl stencils. Here’s a bit of the process. The lush and abundant flora of New Orleans inspires me. I love photographing my garden and the floral streetscapes in my neighborhood, even at night when colors and forms take on a mysterious and luminous quality. Photos are used for inspiration though I work primarily from imagination and through exploration of paint and other materials. 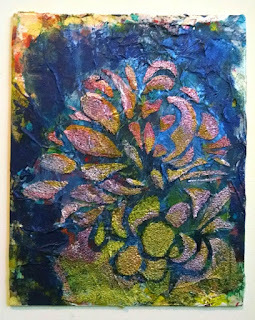 Part of the process when starting new work is to explore a variety of approaches on a small scale. Creating rich, varied and textured surfaces is a big part of what I love to do. GOLDEN’s Glass Bead Gel is one of my favorite mediums and I keep finding new ways to incorporate it into my work. 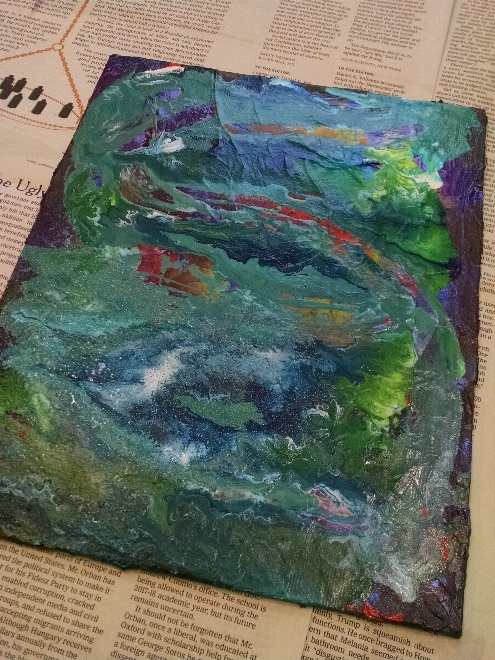 For this exploration, a repurposed, experimental canvas board that already had paint and texture on it was used. A rigid surface such as a panel or cradled panel would also work well. 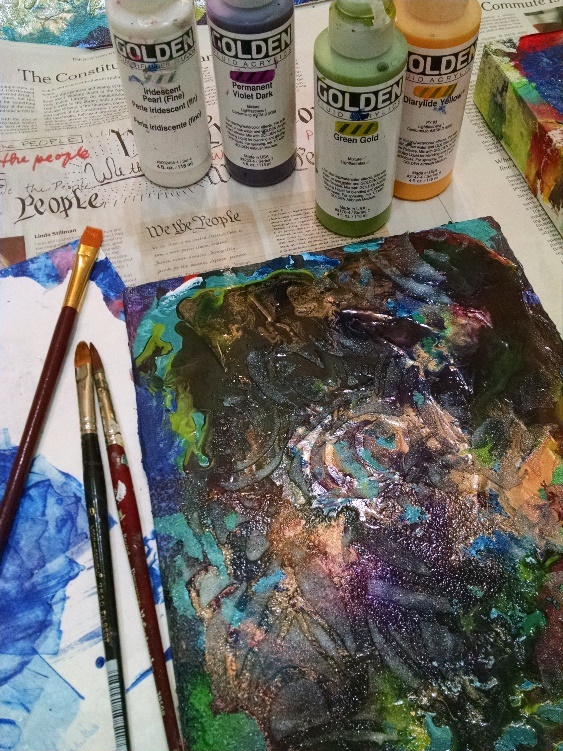 The process started by pouring a variety GOLDEN High Flow acrylics in a freeform manner onto the surface. I spritzed the paint lightly with H2O to help the colors merge and flow into each other. ©Christine Sauer, (L) 8x10, Repurposed Canvas Board (R) GOLDEN High Flow colors used for pouring include Anthraquinone Blue, Iridescent Copper, Permanent Violet, and a mix of Green Gold with Hansa Yellow Light. 1) Let this dry over night before doing the next stage. Because the colors merge in unpredictable ways, it‘s always fun to see how the pour has developed overnight! 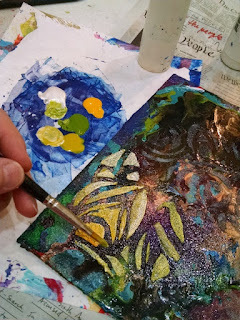 2) The next layer is GOLDEN Glass Bead Gel applied with a palette knife through stencils. Suzi Dennis' Ripple stencil, shown here, and Floral 2 by Traci Bautista were used in small sections and turned different directions to create an organic, abstract design with a sense of movement. 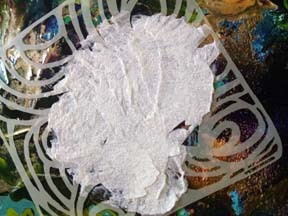 I love the gritty texture of the Bead Gel as a contrast to the smoother poured paint. Let dry approximately 4 hours or until it has dried clear before adding paint on top of the Bead Gel. TIP: Carefully lift stencil. Use a small color shaper to clean up between spaces if needed to keep shapes clean edged. ©Christine Sauer, (L) Wet Glass Bead Gel design (R) Dried Glass Bead Gel. 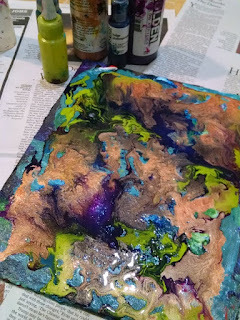 Fluid Acrylic colors for painting on top of dried Glass Bead Gel. 3) All colors were mixed with Iridescent Pearl to create sheer, luminous color and to provide high contrast to colors below. A small Filbert brush was perfect for the job. Sometimes it’s hard to see the dried Bead Gel Shapes. I used the photo of the wet Bead Gel as a reference. TIP: Iridescent paint dries quickly. Spritz your palette with a little water periodically while painting. ©Christine Sauer (L) Iridescent colors added on top of Bead Gel. 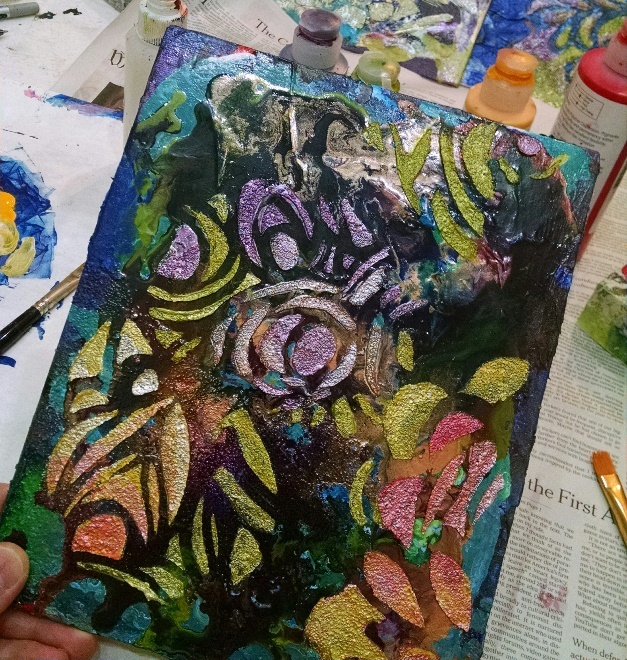 (R) Completed layer of Iridescent colors. The above piece is still a work in progress and will still get some tweaks. Below is another iteration of this process. They have even more texture than the above piece. For these I created a painted tissue layer first. 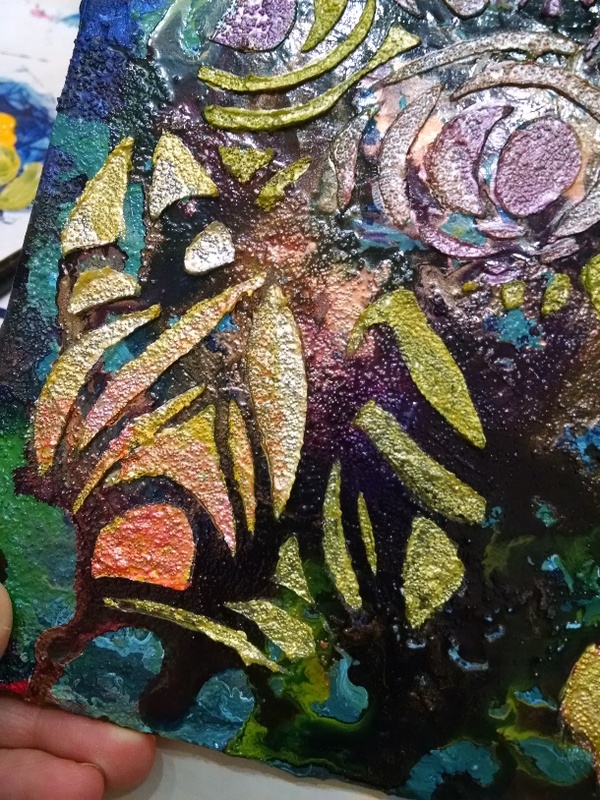 Then a dark glaze layer was added that allowed for the tissue colors to show through a bit prior to adding the Glass Bead Gel flora. 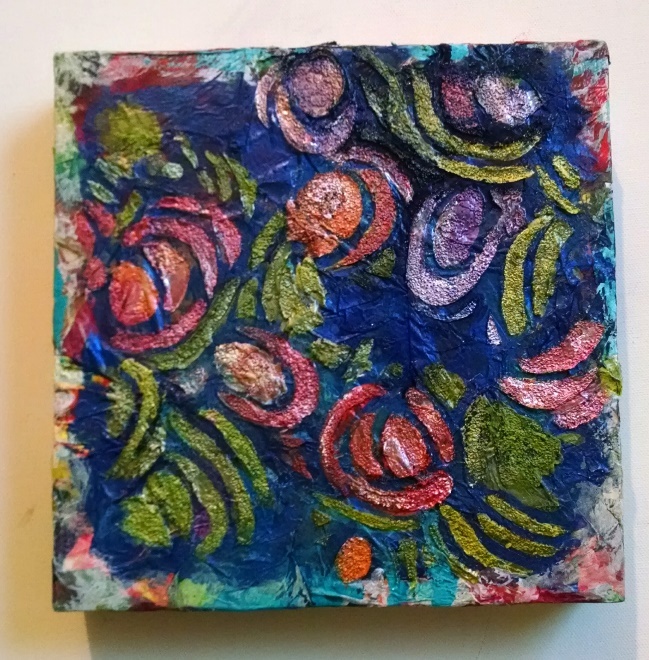 My paintings, mixed media, and fiber art are intuitive, colorful and abstract. 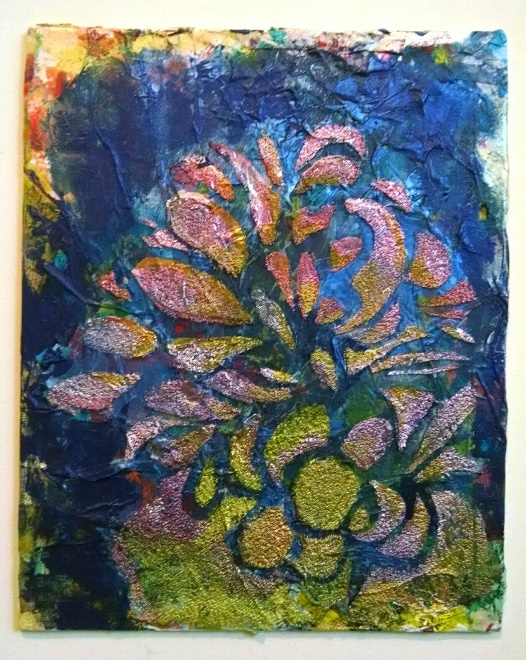 As an artist living and working in New Orleans, I have exhibited my work in solo and group shows in galleries and art centers here, around Louisiana, and in other parts of the country. As an educator, I’ve been teaching for over twenty-five years to all ages and experience levels in schools, museums, art centers and more. Currently I teach painting and mixed media workshops for adults. 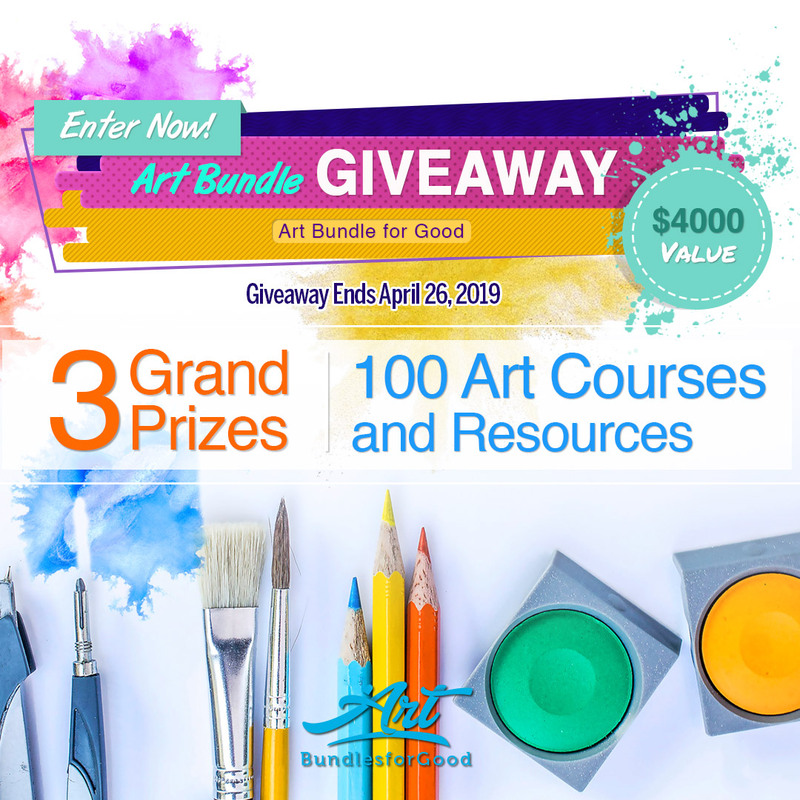 I’m a certified member of the GOLDEN Artist Educator Program, sponsored by the paint company GOLDEN Artist Colors, Inc. Absolutely gorgeous!! Thanks so much for sharing your process, Christine! !